Louise Revell, Roman Imperialism and Local Identities (Cambridge: Cambridge University Press, 2008). 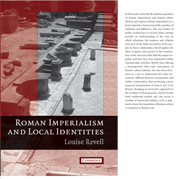 In this book, Louise Revell examines questions of Roman imperialism and Roman ethnic identity and explores Roman imperialism as a lived experience based around the paradox of similarity and difference. Her case studies of public architecture in several urban settings provide an understanding of the ways in which urbanism, the emperor and religion were part of the daily encounters of the peoples in these communities. Revell applies the ideas of agency and practice in her examination of the structures that held the empire together and how they were implicated within repeated daily activities. Rather than offering a homogenized ‘ideal type’ description of Roman cultural identity, she uses these structures as a way to understand how these encounters differed between communities and within communities, thus producing a more nuanced interpretation of what it was to be Roman. Bringing an innovative approach to the problem of Romanization, Revell breaks from traditional models and cuts across a number of entrenched debates, such as arguments about the imposition of Roman culture or resistance to Roman rule. A scholar of Roman architecture and Latin epigraphy, Louise Revell is lecturer in the department of archaeology at the University of Southampton. Descriptions and access at Cambridge University Press, Amazon. Thanks to Sarah Benson for pointing us to this story on the BBC about Google Earth’s new project that gives 3-D views of ancient Rome. You can find the BBC story here. You can download Google Earth free here. You can read or listen to the story here. The web site also includes photographs, music, and other materials about the events of 1968 and the “Years of Lead” that followed. Matt Gross, the New York Times “Frugal Traveler,” is in Rome this week, “Wandering Beyond Classic Rome.” He describes some of my favorite restaurants and captures the pleasures of walking about the city on a budget. Of course, this is the travel and tourist business and he’s a working journalist, but that does not seem to get in his way. This is the Rome of the senses stays in the memory. President George W. Bush is in Rome today. Here he is visiting with Italian Prime Minister Sylvio Berlusconi, recently re-elected to the office. George Bush has visited Rome more than any other European city in his term as president. The photo is from today’s La Repubblica, which reports that the American Academy in Rome displayed on its facade the slogan, “Basta Bush” — enough of Bush. 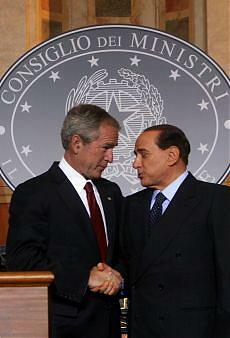 Berlusconi has supported the U. S. war in Iraq; the Italian people appear to be strongly against the war. Last week our students in the Rome program visited the church of San Giovanni in Laterano. “On the eve of Easter I saw at Saint John Lateran the heads of Saint Paul and Saint Peter that are shown there, which still have their flesh, color, and beard, as if they were alive: Saint Peter, a white and slightly longish face, his color ruddy and inclined to the sanguine, a forked gray beard, his head covered with a papal miter; Saint Paul, dark, his face broad and stouter, the head bigger, the beard gray, thick. They are up high in a special place. The way of showing them is that they call the people by the sound of bells, and by fits and starts lower a curtain behind which are these heads, side by side. They let them be seen for the time it takes to say an Ave Maria, and immediately raise the curtain again; after that they repeat this exhibition four or five times during the day. The place is about as high as a pike, and then there is a heavy iron grill through which you look. They light several tapers around it on the outside; but it is hard to discern very clearly all the details. I saw them two or three times. The polish of these faces had some resemblance to our masks.” Michel de Montaigne, “Travel Journal,” in The Complete Works, trans. Donald M. Frame (New York: Knopf, Everyman’s Library, 2003), 1171. The Blue Guide: Rome mentions that the baldacchino in the church, by Giovanni di Stefano, “contains 19th-century gilded silver reliquaries traditionally thought to contain the heads of St. Peter and St. Paul.” Alta Macadam, Blue Guide: Rome, 9th edition (New York: Norton, 2006), 361; there is a photograph of the gilded reliquaries on page 359. Student observations of the Lateran – Hilary Hannan, Josie Moore, Kevin Boyle, Mark Hlavacik. Jessica Sheffield, a graduate student at Penn State who is teaching with us in Rome this summer, is discovering flowers and gardens in Italy and building a nice account of them on her blog. Our students interested in Roman gardens will want to explore the Borghese Gardens, the Villa Doria Pamphilj gardens in Trastevere, the Botanical Gardens, also in Trastevere, and the Villa D’Este in Tivoli. 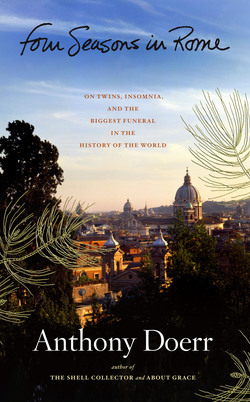 Especially recommended as a historical account of the Italian garden is Claudia Lazzaro, The Italian Renaissance Garden (New Haven: Yale University Press, 1990), a beautifully illustrated book by a prominent art historian. 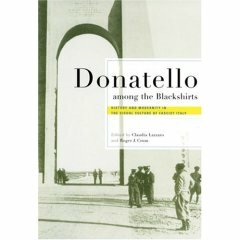 Professor Lazzaro is also co-editor, with Roger Crum, of another book that might interest students of the rhetoric of Rome — Donatello among the Blackshirts: History and Modernity in the Visual Culture of Fascist Italy (Ithaca, NY: Cornell University Press, 2004). Students of rhetoric may also be familiar with Lawrence W. Rosenfield, “Central Park and the Celebration of Civic Virtue,” in Thomas W. Benson, ed., American Rhetoric: Context and Criticism (Carbondale: Southern Illinois University Press, 1989), which reflects on the Italian garden as a social and civic space.